Congratulations! You have won a Simple Truths ring from Erin at Tesori Trovati Jewelry! Send Erin an e-mail with your address and she will get your prize out to you very soon! Melanie Brooks of Earthenwood Studio. 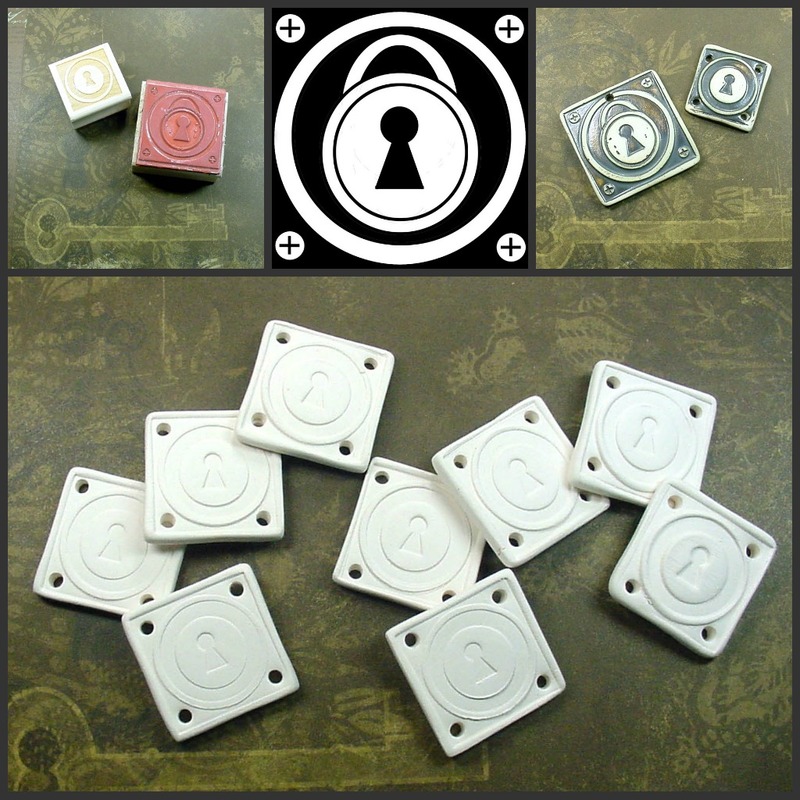 I have been working on some new designs lately that are based on hardware, things like locks and keys. I seem to balance my designs between images that are organic and images that have a harder edge to them. I have been enjoying designs that are somewhat more masculine and industrial lately. My technique is to do a drawing (or in this case, a computer designed image) and have a rubber stamp made from my design. This technique works really well with my ceramic clay slab roller and porcelain clay, because I can stamp many pieces at once and get a nice, clean image that was easy to create! Here are some of the finished pieces. I created a padlock and a keyhole design to make pendants and links that work well together. This is one of the first images I have created entirely online, without physically drawing, and I am pleased with the crispness of the lines and the bold image. I use my computer a lot in my design process, but this is the first time I have designed something entirely in Photoshop to be made into a stamp. I look forward to making more in this series! I was so excited to get these four hole keyhole links out of the kiln, I immediately whipped up this necklace with gunmetal, Tierracast pewter, and glass pearls. The gunmetal finishes and the dark metallic pewter glaze really compliment each other well, I think! I will soon have some of these new pendants in my Etsy shop. You can win two of the first ones out of the kiln! Leave a comment here on this post telling me some of the things you use your computer for in your art-making process. One random winner will be chosen to win the pair of pendant and link shown above. Good luck! Melanie is an artist, blogger, writer, and ceramic beadmaker at Earthenwood Studio. Her beads and components can be found at her Etsy shop and her jewelry can be found in her Etsy Galleria. I mainly use my computer for picture editing and blogging but I wanted to tell you I love those pendants. I use the computer to get some design ideas and to help my creativity when I am going through a funk. I also order most of my supplies online. Beautiful pendants! Nifty keyholes! I use my computer all the time for graphic design, but really not for jewelry design, except photo editing. I use the computer a lot for designing everything -- from jewelry to quilts to printed labels and cards. I love taking a photo of somthing that is half finished and playing with it in paint or powerpoint to get an image that I like and use it as a "construction drawing". I would LOVE to win your new pieces -- they are great! Melanie, From discovering fun stuff by etsy artists to incorporate in my jewelry, reading all these fun blogs (and getting inspired to start my own), to browsing some of my favorite fashion designers and brands for seasonal color palettes,and last but not the least - skyping with my mom in India to share my jewelry in the making process ! I use my computer to create design pillows. I use old advertising art also in a very small scale in jewelry design. I like importing my sketches/drawings and then playing around with the color, particularly creating a negative (reverse color) or shifting the color scale. In some cases, I'll then these new images and stitch them together to form digitial "quilts". Woot! You know I can't resist a key or a keyhole...or, well, anything that you create! I will be first in line to get some of these. Love them! And I love hearing the design process. Thanks for sharing! I enjoyed hearing how you make stamps out of our computer-generated designs. Good idea. I use my computer for blogging and for creating color pallettes. I also use photoshop for designing and photo editing. I use my computer for picture editing. I also use it to blog about my creations. And I've started using it to get color ideas/palettes. I've found a couple of wonderful sites for color inspiration. Those links are great. Turned out really cute. I Love your new pendants and Would love to win a set! Nice work...make me miss my kiln! I use my computers for everything from findin inspiration, learning new techniques, ordering supplies, meeting other artists and design and color work. I use my computer for inspiration, picture editing, and music/movies while creating. I use my computer for photo editing, shopping for jewelry supplies, listing jewelery and the beat goes on! I use my computer for everything from online classes to pinning my art on pinterest to working on starting my etsy shop(I'm kinda new to the internet)to making new artistic friends. I love to chat & share thought & ideas with other creative individuals like myself. I use my computer all the time, storing my inspiration images, editing those images, printing on silk, sharing on my blog and more! I like your new computer driven designs! While they were designed on the computer, you still get the hand made feel, with the slight imperfections! Lovely! I use my computer to order supplies, get inspired, blog, photo edit, you name it!